Posted August 27, 2015 & filed under Events in Dewey Beach DE, Things to do in Dewey Beach DE. Looking for a fall-themed activity that will entertain the whole family during your upcoming trip to the Atlantic View? Consider an October evening of haunted fun throughout Dewey Beach! A great activity for families of all ages, “Trick or Treating and a Haunted Bonfire” will take place on Friday, October 23. Put on your most spook-tacular costumes and kick off the evening with Trick or Treating from 6:30 p.m. to 7:30 p.m. Sponsored by the Dewey Business Partnership, take this opportunity to check out our town with your kids, visiting marked Dewey Businesses to get in the Halloween spirit! 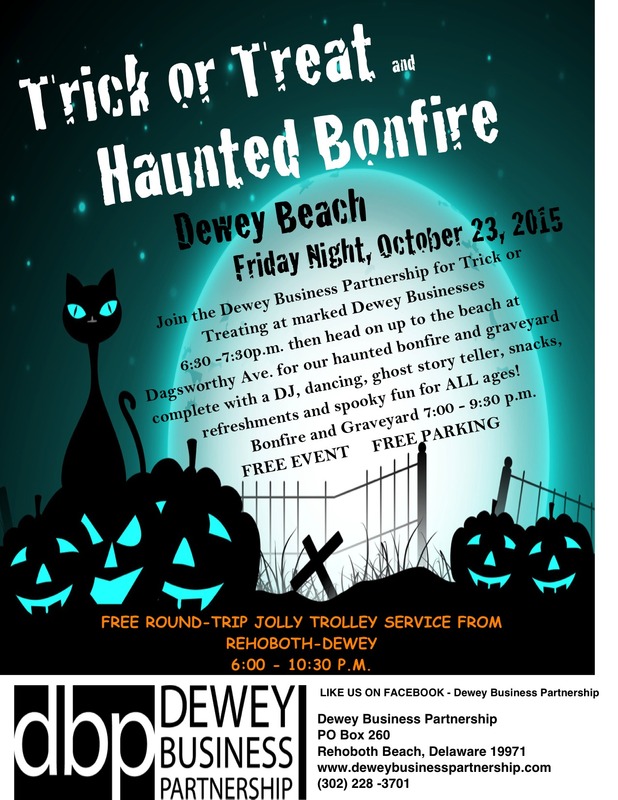 Once your bags are bursting with candy, head to the beach at Dagsworthy Avenue to warm up by the haunted bonfire. Dance along to the DJ before listening in to ghost stories around the fire – or wander through the graveyard, munching on Halloween snacks and refreshments. The bonfire and graveyard will be open until 9:30 p.m.
Visit the Atlantic View to book your autumn stay. We look forward to seeing the creative Halloween costumes you come up with this year!